Read the founding statement for the Faith, Economy, Ecology, Transition coalition (FEET). See the list of 80+ signing organizations. Sign on to the statement. View a reading of the statement with accompanying photos, click here. Read and comment on our draft Ecological and Economic Principles. Finally, follow us by clicking on the “follow” button at the bottom right of your screen and receive an email each time a new article is posted. Eco-philosopher Joanna Macy’s invitation to cultivate active hope in challenging times is energizing the Sisters of Mercy’s justice coordinators’ work of unmasking and addressing the underlying causes of our main justice concerns and the interconnections among them. The Sisters of Mercy are committed to protecting Earth, standing in solidarity with immigrants, practicing nonviolence, responding to racism and embracing our particular concern for women. We are increasingly realizing that at the roots of all of these is an economic-political system that is destroying vulnerable people, communities and cultures and Earth. We find Macy’s framework for engaging with challenging issues extremely helpful: first grounding ourselves in gratitude, then honoring our pain for the world, and out of that “seeing with new eyes” and taking action. Part of “seeing with new eyes” is acknowledging the three realities that Macy asserts are operating in our time: (1) Business as Usual, in which people see little need to change the way we live; (2) the Great Unraveling, which can be paralyzing as people dwell on the resulting disasters they see all around them; and (3) the Great Turning, which involves engaging in the transition from an industrial-growth society to a life-sustaining society. We are choosing to be part of that Great Turning. To get a glimpse of what that might involve, at a recent meeting we analyzed who benefits from and who is harmed by Business as Usual and the Great Unraveling in the global extractives industry, immigration to the United States and the United States’ seemingly never-ending war. For each issue, we looked at the underlying political-economic system, socio-cultural norms and core spiritual values. So how do we even begin to grapple with these realities? Holding actions, which are designed to hold back and slow down the damage being caused by the political-economic system underlying Business as Usual. These include moratoriums on fracking, reducing deportations of undocumented immigrants and supporting victims of human trafficking. Life-sustaining structures, which re-imagine everything from where we shop and what energy sources we use to how we design healthcare and transportation networks. Examples include supporting local banks and local economies, integrating peace-making into our schools and building welcoming communities for immigrants. Shift in consciousness, which involves nurturing compassion and other values that deepen our sense of belonging in the world and inspire us to work for this life-sustaining society. This process could be helpful for all working toward a paradigm shift in mindset and values; public policies for an economy of right relationship; an economy of thriving and resilient communities; and a return of corporations to their proper place in society. An “anchor institution” is a large non-profit institution, classically a university or hospital, that is bound by place–unlike a corporation which has a lot of resources, but can easily move. Anchor institutions have more job creation potential and stability than most corporations, which local governments are always trying to lure away from their neighbors with sweeter tax deals. Supporting the community economy can come to be seen as a basic part of being such an institution. In Cleveland’s Glenville neighborhood—which is a poor, mostly black neighborhood with high unemployment and an average income of about $20,000—there now exists a complex of worker-owned and environmentally conscious companies called the Evergreen Cooperatives. The greenhouse, the laundry and the solar installation company employ over 80 community members, and all serve the three anchor institutions in the neighborhood—two major hospitals and a university. Those anchor institutions, which together purchase about $3 billion in goods and services a year, did their purchasing until recently almost entirely outside the community. 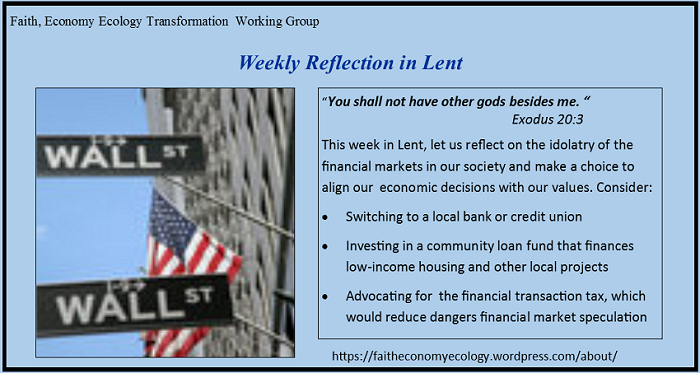 Throughout the Lenten season, the Faith, Economy, Ecology Transformation (FEEt) Working Group will be producing a short weekly reflection in an effort to connect our principles to Lenten themes of renewal and reparation. 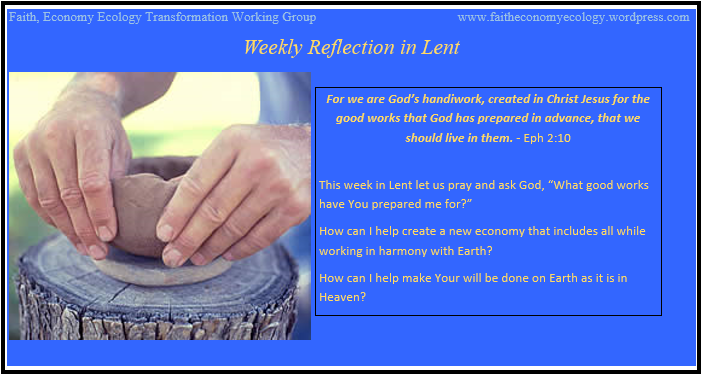 Week #4 focuses on God’s call for us to work in harmony with the Earth. Week #3 focuses on how we can choose to align our economic decisions with our values. 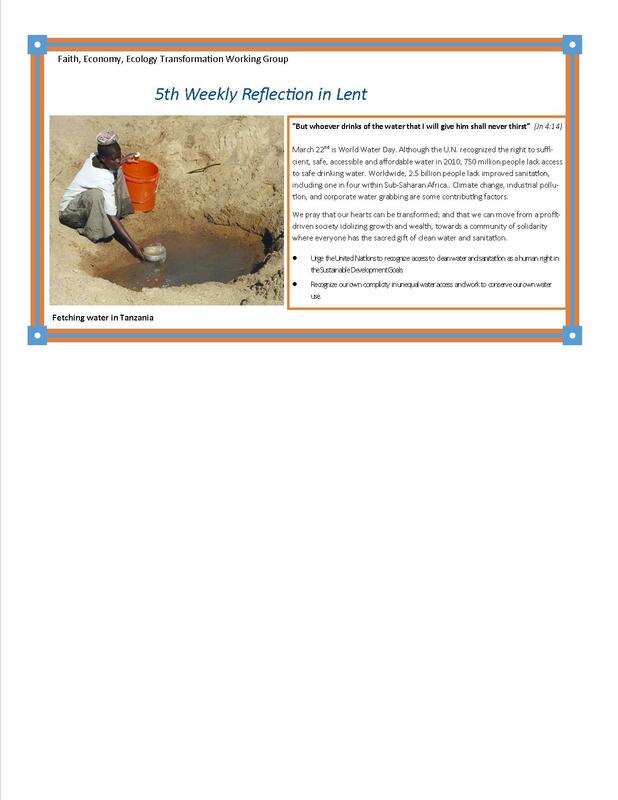 Week #2 focuses on the impact of harmful free trade agreements on the most marginalized among us. The Faith, Economy, Ecology, Transformation group (FEET) that maintains this website hosted a series of Webinars that look at the roots of corporate power and influence and what roles people of faith can play in diminishing that power and influence. Please click on the titles of the webinars to watch the video (note that the first webinar is audio only). The moral imperative for a minimum wage is clear. But what about a maximum wage? It’s not hard to make the case that something needs to be done. Back in 1965, US CEOs in major companies earned 24 times more than the average (not minimum wage) worker. A typical American CEO now makes 380 times more than the average worker. Around the world, change is in the wind. An Egyptian ruling that a maximum wage in the public and government sectors be no more than 35 times the minimum wage has been in force since January 2012. France’s president last summer promised to cap the salary of company leaders at 20 times that of their lowest-paid worker. In February, new code amendments of the German Corporate Governance Commission, which all German companies follow, were released, including a mandate that all publicly-traded firms place a cap on executive compensation. While the specific executive pay maximum is left up to each corporation, the Commission made it clear that current pay levels have soared too high. The immorality of our current situation is clear. Perhaps the time has come in the US to talk about a maximum wage as well. How to “Mainstream” a new Cosmology? David Korten has written an article (“Religion, Science, and Spirit: A Sacred Story of Our Time“) that could serve as a clarion call for all people who are unsatisfied with the current dichotomy of science and mainstream religions, both of which fail to appreciate and care for Earth and the amazingly interdependent world of life created by God. He left me wondering about how those of us who are part of a shift to a more holistic worldview can be more visible and invite others to the exciting opportunities opening up. In the article he describes three cosmologies that have influenced the Western worldview: monotheistic religions, science, and what he calls the Integral Spirit worldview. While the first two cosmologies have strong institutions and traditions representing their worldviews, the last has no real structure in Western society. This is especially problematic for Korten because the religious and scientific worldviews accept extreme inequalities as natural while also diminishing the value of the natural world; thus, creating the mindset that has brought about the rapid destruction of Earth we witness today. It is through bringing more people to adopt the cosmology of the Integral Spirit that humanity may be able to revert the situation in order to avoid further destruction and live in better harmony with Earth. Meanwhile, the scientific worldview sees the cosmos as a grand machine where “…only the material is real. The formation and function of the cosmos and the evolution of life are consequences of a combination of physical mechanism and random chance. Life is an accidental outcome of material complexity and has no larger meaning or purpose. Consciousness and free will are illusions.” The basic law of nature “is a brutal competition for survival, territory, and reproductive advantage.” Social Darwinism, an extension of this worldview, easily accepts extreme inequalities as normal, a result of this competition. This last paragraph really caught my attention. I think it touches on something very important that is lacking today. While more and more people are changing their worldview toward something like the Integral Spirit cosmology, it is a silent, invisible change. How can we, who want to encourage this societal shift to a more integrated view of Earth and life, make the change more visible? How can we bring together those who are already shifting their worldview so that others can see that change is happening and that they could be part of this paradigm shift? It is not an easy task. To create new institutions based on the Integral Spirit runs the risk of creating bureaucracies that restrict that Spirit; of repeating many of the problems with our current institutions. Yet without recognizable organizations and institutions, it will be difficult for people to see the growth of this worldview and to know how they can participate in it. Some of the reflections and small group processes that we have created on the Scriptural and Theological resources page of this website are a good start, I think, at helping people to discover the Integral Spirit and the need for a paradigm shift in Western societies. But much more will be needed in order to incorporate these new adherents and create a visible movement. 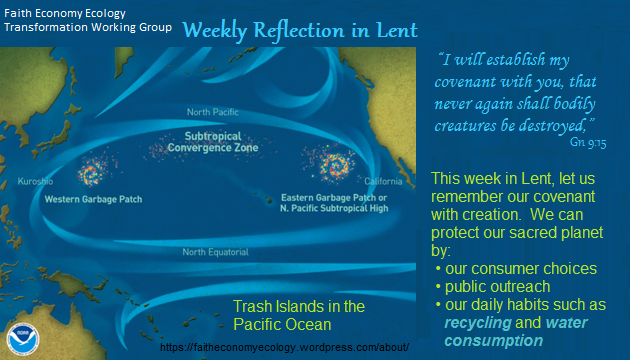 What more can we, as participants in the Faith, Economy, Ecology, Transformation coalition, do to help spread the word?